We’ve got some very interesting information to get out today, but just to make sure I don’t get accused of leading people astray, the data I present to you today does not prove anything. Stats don’t prove things to be true, but they can be very meaningful when extracted and interpreted correctly. Today, we have but one single data point. Got it? It’s a sample of ONE, meaning that I’m certainly not out to suggest that this is the end-all-be-all. However, this single data point could be one huge step for humanity. The NDC is currently germinating a project called Paradigm 3. In this project, we have two juxtaposed teams that are working in isolated web-communities to predict-create the future. It’s fate vs destiny at it’s best, and Paradigm 3 intends to find the ideal balance between predicting what will happen vs. creating what we want in this reality. It’s revolutionary, and you can be a part of it. Learn how to participate in this link. 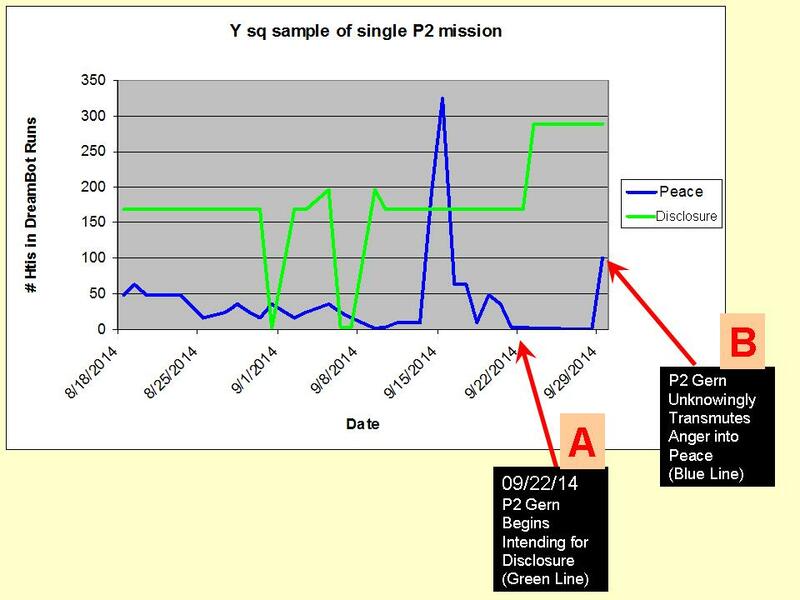 P2 is the group under Paradigm 3 who could care less about what P1 is predicting. “Damn the torpedoes…we’re creating the reality we want from this life!” is sort of the mantra from this group. Come hell or high water they’re the idealists who have a strong urge to make this world better. Starting now, the second requirement is P2’s big mission, and week after week we’ll be seeing how well our P2 members can influence the DreamBot results. The reason why? Well, at the NDC, our two closest venues for mirroring the near future are 1) the DreamBase dreams and 2) the DreamBot. Individually, those two can predict amazing results individually, but when combined together, lookout! We saw this in our Project August results. 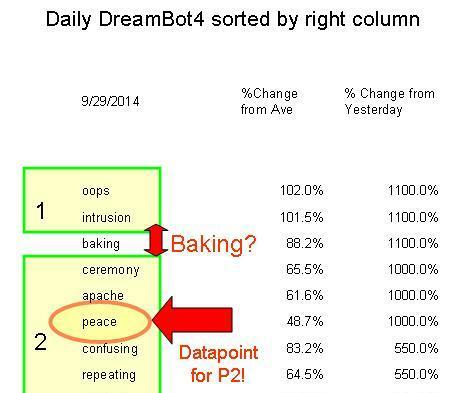 So, although causality is completely ignored here, rightly or wrongly, we proceed with measuring P2’s effectiveness by correlating their work with our DreamBot. 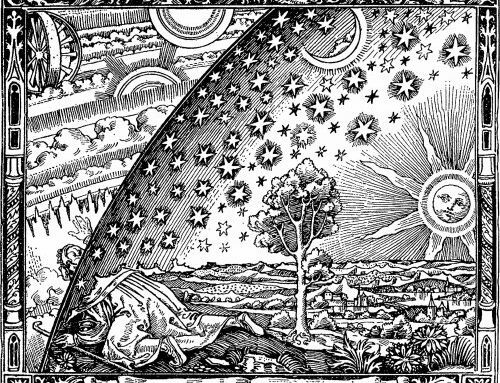 In time, we hope to capture some relevant correlative datasets to skip the DreamBot and go straight from the P2 intentions to waking reality (i.e., headlines). That will take quite a bit of time, however. So for now (especially since we’re just now starting with only a handful of people), let’s go see what P2 produced recently. How many people does it take to change out a lightbulb? How many people does it take to affect the DreamBot results? Ask anyone in P2 (except one who had an “it depends” answer), the answer is ONE! So, that’s what we’ve been doing. Our first session was neutral (single person had no effect on the Dreambot), and so we fell back on the works of Gregg Braden, Dean Radin, Roger Nelson and many others, to only intend towards word or phrase that evokes much emotion. Basically our first test employed a neutral word, and since we’re recording emotional intensity and level of focus in our study, we noticed quite easily that first person was not emotionally charged over the word they selected. Thus, the requirement for the next mission was to select a word with lots of emotional charge to it (for the person doing the intentions). P2 member “Gern” is a fully conscious co-creator. 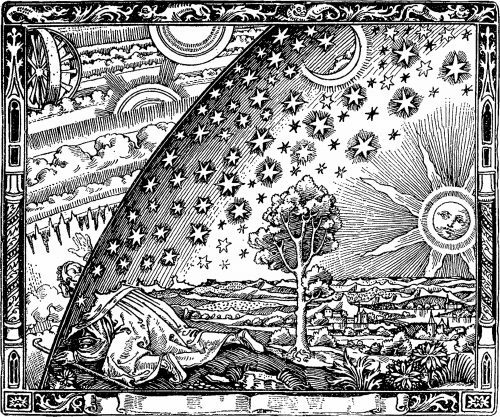 He emphatically wanted to influence the DreamBot by injecting the collective unconscious with a suggestion for “Disclosure.” He wanted the purposefully hidden advanced technologies to be disclosed to the public. He knows what many people do…they’re holding something back from public view.. something that could free humanity. The “Disclosure” intention began on September 22, 2014 by a single P2 person we’ll name “Gern.” Each day for one week, Gern prayed, intended, meditated on the word Disclosure. Each day, we looked at the results without showing Gern his impact (if any). Gern began his intentions for Disclosure on 22 Sep (Ref Point A). He documented his modalities each day to include intensity and focus as well as the amount of time spent. Interestingly, the amount of time he spent on Disclosure remained fairly stable at about 1hr 40min to 2hrs each day until 26 September when he dropped to about 30 minutes BUT his intensity and emotion on that day were higher than any of the other days. Thus, if the green line (representing Disclosure) has any connection to Gern’s intentions, that could suggest that intensity might be able to replace time spent since the green graph remains at the high level even after Gern’s time drops. Overall, Gern appears to have “pushed” Disclosure up about 31%. According to our growing body of statistics, this isn’t a strong enough surge to produce “reality creation,” but it’s definitely a great start. But even this isn’t the reason for the post. Now we get into the meat and potatoes. 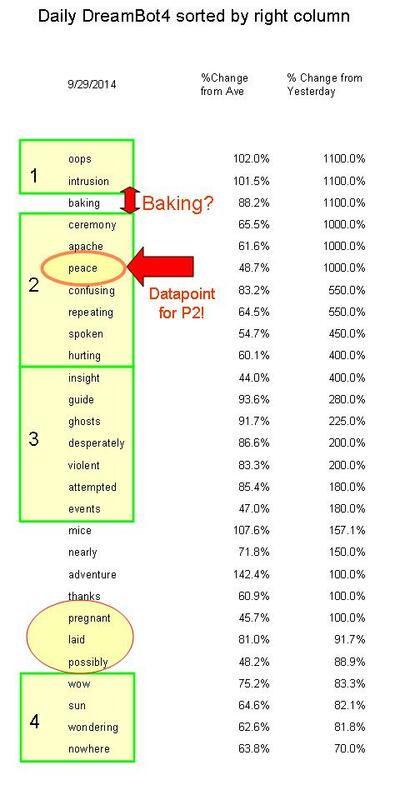 In Ref Point B, you can see that just before the Gern’s week ended, we saw a mysterious quick spike in the word Peace. Remember, this is only one single data point, so take this with a grain of salt. Gern attempted to accomplish his last night of focused intention for Disclosure. However, he was still boiling from an apparent argument with a family member. As he attempted to calm down for his session, he felt angry still and unable to concentrate for the word Disclosure. Therefore, he backed off and reverted to his Peace prayer…. The way I understand it, Gern uses a Peace platform when times get tough. From what it sounds, he permeates his being with a specific prayer, and the resulting vibrations allow him to create a platform for other intentions, except on this particular night, he remained in Peace. I was hurting pretty bad last night for getting into it with my son. Then I started out with the original intention – over my previous guided meditation for peace (that I contemplate throughout the day – not recently) So that was probably pretty confusing as I was trying to get the results you were looking for and then dropped the intention and went back to straight peace. The repeating was my prayer for peace to Saint Francis and let there be peace on earth. The Apache ceremony could not tell you what that might mean, except that I have meant to do an Native American Anger ceremony for quite some time – to release that emotion, and forgive those who stole cattle from me, pulled guns during a cattle drive and a myriad of other issues that hold me back. It’s subtle, but its there. Gern needed an anger release, and the fuse was a fully emotional work up with his son. So, we have bottled up anger from past events, exacerbated by a short fuse with the familial conflict…AND THEN we have the unintended transmutation into peace. AND THEN we had Peace show up again on our Daily DreamBot run the next day. This is where this article was going all along. Remember, this is only one data point, and surely there are millions more people around the globe intending for peace. But this certainly is something speculate, might raise an eyebrow or two. Go back to the green Disclosure lines on the graph (below). That looks like a huge jump, but percentage wise its pennies compared to the leap incurred by the Peace surge (blue line). This last DreamBot run and Gern’s last Anger-to-Peace experience was coincident (occurred simultaneously). But was it causal? Well, that cannot be determined, so let’s keep going down the hypothetical trail to see even more datapoints here. Back to the diagram. Let’s look at the rest of the blue line, which represents Peace. What’s that significant spike in the middle? More importantly, was that predictive, or was it Day Residue? Remember, the blue line signifies the number of times the word Peace shows up in the collective dreams (as counted by the DreamBot). Thus, on the 15th of September, the DreamBot found a huge surge in the collective unconscious. Turns out that there was a lot of Peace-oriented stuff going on. 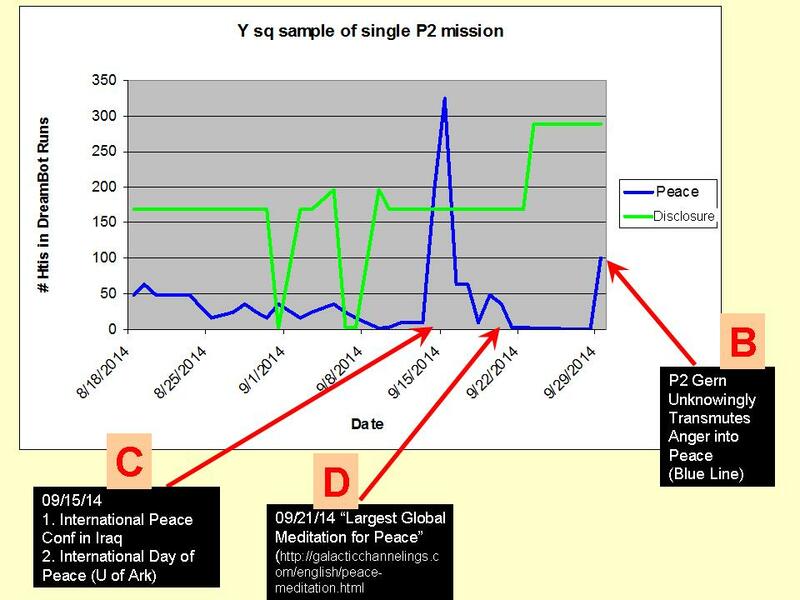 On that very day (15th) there were two big international peace activities (ref Point C). But on Ref Point D, there was claimed to have been the “largest meditation for Peace.” I can’t help but note that Gern’s event coincides with a bigger push in the collective than Point D. Remember, this is largely hypothetical. We can’t rule out coincidence on these graph spikes, nor can we annotate any sort of causality. Unfortunately, we don’t know how many people showed up for that meditation at Point D, but here’s my initial impressions based on this chart. First, one person can make a difference, but Braden is correct in that STRONG EMOTIONS ARE CRITICAL. In a very simplistic manner, I almost want to say that a single person’s super-highly charged emotion is worth more than a group of half-charged intenders. This could also explain the surge on the 15th. I would have to imagine that the emotions were running pretty high in that international peace convention in Iraq. Don’t disregard how Gern’s strong Peace intention was supercharged. Although largely accidental in this case, the strong peace intention rode in on a bucking horse called Anger. Starting from scratch emotionally is hard. It’s difficult to generate true, authentic, surging emotion from purposeful thoughts. But Gern’s accidental intention makes me believe that transmuting the POWERFUL emotions of hate, anger, fear, etc. is a most excellent way to super charge your positive intentions. Accept the emotion…welcome it in. Feel it, learn from it. What is it saying to you? Transmute. Focus on the feeling of the emotion. Organize it. Don’t suppress it. Let it well up. Let the chaos arrange itself just by having your attention. When it feels “organized” (meaning that your being recognizes positive outcomes with this well of energy), consider it transmuted and ready for employment. What is your positive outcome? Visualize it. See your energy funneling to that outcome. See it growing like a big oak tree. You just created. Congratulations. Watch your thoughts. If you return to the previous so-called “negative emotion,” then you did not accomplish the steps correctly or completely. If those memories charge up the emotion again, you’ll have to extinguish the egoic emotional energy. I have a chapter dedicated to just that in my first book. Paradigm 3: The New Journey has Begun!